-----------------------------------------This game is terrible, I want to see this game get torn to pieces.I thought that this game was fine at the time of me being 12 but now I can't freaking stand this game. DESTROY THIS GAME! NO MERCY!!! Good Luck...you'll need it to survive. All Sprites and Music credits go to their original creators. Not bad, Keep up the good work! It's by no means a "good game" but I had fun playing it. It reminds me of early to mid 2000s fan games. Not to imply that it would have been considered good even then, it just has that feel. It also reminds me of my Mario games I would make with Clickteam products when I was 12 except my visuals were never quite as ugly (but my programming was much worse!). This game isn't an abomination as you believe it is! You seem to be overreacting here. It's not great, but it definitely isn't terrible. The engine is pretty decent (flaws aside, mostly concerning collision, especially with the rising platforms), and it looks like you coded it on your own instead of using another engine as a base like most beginners here tend to do, so that's a plus. Level design is not really good on the second and third levels (the third one was pretty short). Graphics choice is nice. It's by no means acceptable by today's standards, but it was definitely a good start. If you didn't have a pleasant experience making this game, then why did you continue? You could've trashed the project and called it a day. Fin. Also, comparing this game's collision to BR:OtRR's is quite ridiculous to me. That game didn't even have programmed collision for walls! That game wasn't a game! I mean when it came to attempting to re-upload and fix difficult levels within this game. It had been years since I had seen this and I wanted to upload SOMETHING to this MFGG considering I've been an observer for about 10 years. At least you tried to make a good fangame here. This had effort put into it, but several setbacks and the lack of fun in making this led to this game's downfall. I have a review of this game in the queue right now. At the time of making it, the game wasn't a lack of fun to me. It's just that...I was 12, stupid, and didn't know what scripting was. But yeah, this game is absolute garbage. REAL QUICK: When I say I didn't have fun making the game, I mean stabilizing the game to upload. 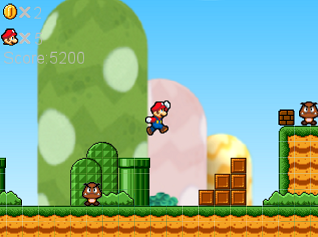 Back when I was 12, I had a lot of fun making the game, screwing about with Game Maker and finding more efficient ways to code (drag 'n' drop) Before I stabilized the game, half of the time levels wouldn't transition, there was no death trigger if you fell off the level and after Bowser there was some stupid and cheesy message about how "this game was a lot of fun and hope to see you return to play future projects"
Hi Dr. Misfire, make a game called "Super Koopa Troopa"
You're taking a very wrong path here. Why don't you try making the game on your own? Don't upload bad games on purpose. Put that stuff on GameJolt. Depends. It's literally just another Mario Fan-Game with standard level design and nothing else to add really. But Hey who knows.